The Milwaukee Brace (Figure 3.3) is probably the earliest brace specifically designed to treat scoliosis and has been used world-wide with varied success, however, due to its very uncosmetic appearance, it is being replaced by TLSO braces. 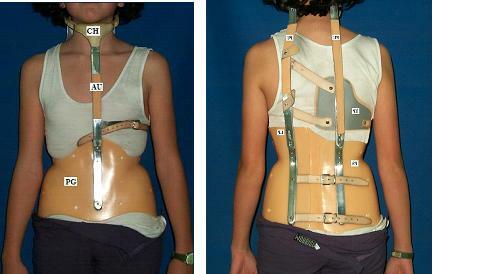 It is a corrective spinal orthosis used in the treatment of scoliosis, lordosis, and kyphosis, however it does not have a derotation element incorporated in the brace. This brace consists of a contoured pelvic girdle attached by three uprights to an occipital pad and throat mould of chin piece. Suspended from the uprights are the lumbar and thoracic pads as well as other accessories (shoulder flange, axillary sling, or subclavicular pads). The function of the Milwaukee brace is to redirect spinal growth by stimulating trunk muscle patterns, while three-point pressure systems play a lesser role (Blount et al., 1958).